Sparaxis are bulbous perennials from the Cape Floral Kingdom in South Africa. They flower in profusion in the spring with a dazzling display of colour. 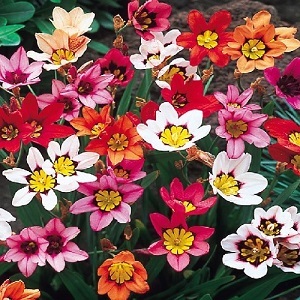 Sparaxis Mixed in a hybrid cultivated form with a mix of star-shaped flowers in red, pink, orange and white in May to June/July. Flowers sit over sword shaped leaves on wavy stems, growing to a height of 30-40cm. Plants are particularly well suited to growing in Mediterranean style gardens or in containers. Sparaxis grows best in a sunny sheltered spot and well drained soil. This is a just-hardy bulb and the planting time depends on your conditions. 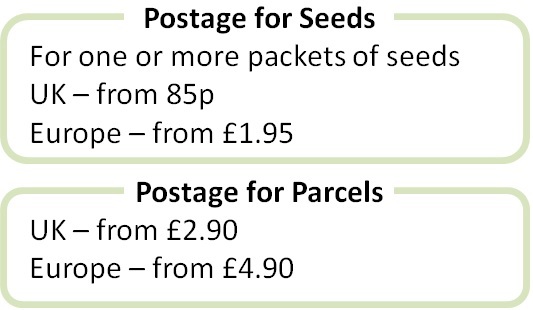 In warmer UK and Mediterranean gardens, plant the bulbs directly into the soil in autumn from September to December. In colder, more frost prone gardens either plant in containers in autumn and keep somewhere protected or plant in the spring in April/May. Pack of 25 bulbs. Plant in autumn or spring. These are good-sized nursery-raised bulbs which flower in the first season. Plant from September to December 8cm deep and 5cm apart in unfrozen soil. In pots, plant 5 bulbs in a 12cm pot. In less well-drained soil place grit or sand at the bottom of the planting hole. After planting, mulch the soil surface to protect the bulbs overwinter. Bulbs can be planted in late spring in colder areas, and plants will flower a little later. Grow Make sure plants have enough water when they are growing and flowering. Remove flower stalks after flowering. Let the leaves die down after flowering andremove when they have browned. Leave the bulbs in the ground over winter with a mulch to protect against frosts. In colder gardens lift and store the bulbs over winter for planting in spring. When plants become congested, lift the bulbs in the summer, and re-plant the mature bulbs and the offsets that form alongside them.